Manager Gary Mills has backed Gateshead to pick up the point needed to reach the Conference Premier play-offs for the first time in their history. The Tynesiders, who finish the regular season against Cambridge on Saturday, occupy the final play-off spot with a three-point lead over Braintree. Gateshead won 2-0 at Macclesfield on Easter Monday. "We know we're good enough to beat anyone in the league on our day, we've proved that," Mills told BBC Newcastle. "There's no reason why on Saturday we can't get the point we deserve. "We've had a great run, a great time to hit form and the players have done superbly." Cambridge have already sealed their play-off place and, depending on results, could provide opposition for Gateshead in the play-offs. "They're [Cambridge] a good side, nothing can change with them, but it's important we do what we have done from day one which, is concentrate on what we do." 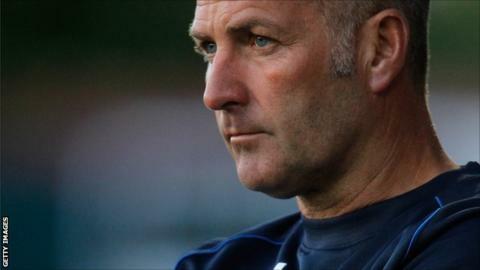 Mills has been through play-off football before, both as a player with Leicester, where as skipper his side lost a thriller against Swindon at Wembley, and more happily as manager with York, whom he took back into the Football League in 2012. However, the Northampton-born 52-year-old found himself sacked by the Minstermen less than a year after a promotion and FA Trophy double and was out of the game until Gateshead appointed him in September. At the time the club had won just one of their opening six games, and Mills' subsequent impact has been visible in the rise from 19th place to the play-off places. "We're in an industry where as crazy as it is and hard as it is, I absolutely love it," Mills added. "You never know where you're going to be in football, I've got the drive and what I've learned is you give absolutely everything to that club that you work for and try to be successful. "I'm certainly trying my best at Gateshead to do what I can to get them out."